Instant: The Story of Polaroid, definitely goes into the category of: books I wish I got to write. But Chris Bonanos, who writes for New York Magazine, (and who married a friend of mine) got to write it and as far as I can tell he loves Polaroid and the story as much as I do, and he did a great job, so … okay. Congratulations, Chris! Bonanos also has a truly great blog for the book which includes links to all things Polaroid and information about The Impossible Project, which is bringing Polaroid film back. There’s also a link to a special edition of the book which includes SX70 portraits of some of the people mentioned in the book. I passed by a film shoot, for the show Law and Order I was told. Who is this actor? It’s been bugging me. I don’t watch Law and Order (sorry) but I know I’ve seen this actor in other things. Update: Thank you, Renee Tobin! It’s Chi McBride. I should add, even though he looks like he wants to kill me, he was incredibly kind to the fans who asked him to pose with them. He took a few minutes to do this, and leaned down and talked and joked with everyone. You should have seen their smiles. 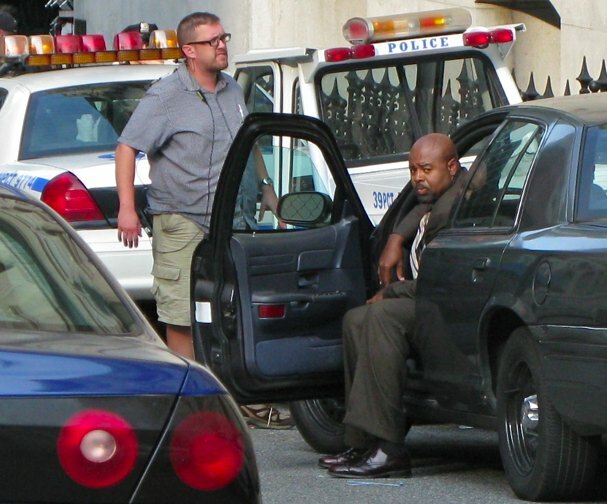 Chi McBride, I think. If he is on L&O I may have to start watching again. But what about our daily Bleek update??? Yes, I want a Bleek update too. If I saw Bleek filming a Law and Order update I’d beg him to pose for a photo with me and I bet he’d be very obliging, too. Haha. I thought I was posting too much about cats.